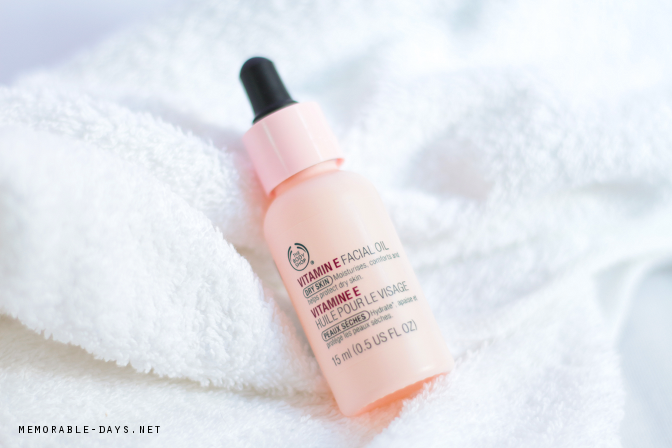 Review: The Body Shop - Vitamin E Facial Oil | Memorable Days : Beauty Blog - Korean Beauty, European, American Product Reviews. Hi sweeties! It has been a few days since my last review ^^" I'm sorry girls for the lack of blogposts recently. I'm quite stressed and tired these days, so i try to rest more instead of looking at my laptop screen all the time. 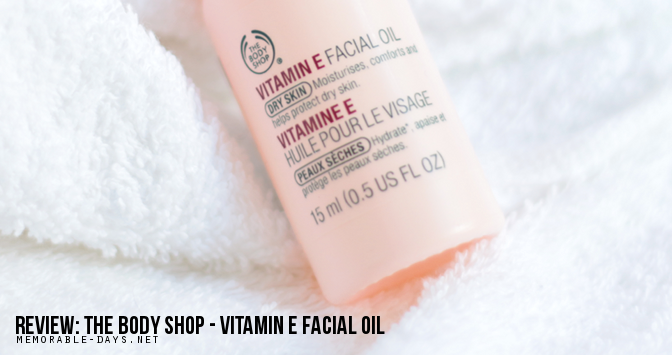 Anyways, today i'm back with a review of a product from The Body Shop - The Vitamin E Facial Oil. Did you know that Vitamin E Oil has lots of benefits for your skin? Continue with reading if you want to know more! This Vitamin E facial oil will boost moisturisation, nourish the skin, it prevents from aging, removes age spots, brown spots and it helps with burn marks. It's ideal for dry skin. Well, I'm 24 years now and it's time for me to use anti-aging products and this is one of them. Always keep your face moist and prevent lines and wrinkles! I have dry spots around my cheek area, so I gave this product a try. I have a combination dry skin type by the way, so i don't apply this on my T-zone since that's the area which gets oily quickly. 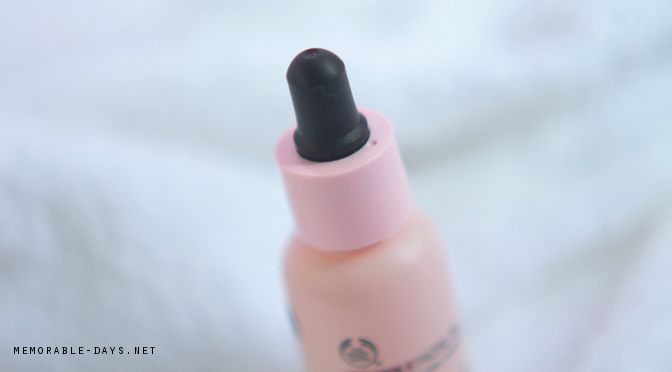 I have been using this facial oil for 2-3 months already and i have to say it's not bad! There is 15ml of product in it and it's sold for €18.- (link to product). It's quite expensive but you will only use 2 drops per time so 15ml of product will probably last you at least 4 months. You can purchase this online or at your local The Body Shop store. 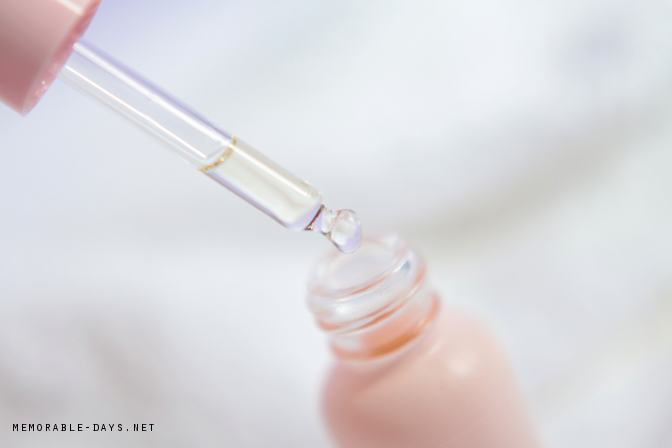 The oil comes in a small glass pipette bottle; the dropper makes it simple to dispense the oil and also controls the amount. Only two drops is sufficient for the entire face. I normally use this at night after applying my moisturizer. I put 2 drops on my hands, after that I rub my hands so they are warmed up, and I pat it on my face while pressing gently. You can also use this in the morning but it does takes approximately 10-15 minutes before it absorbs, so you gotta keep that in mind. I normally don't have much time in the morning so I only use this at night. It has a lavender scent which is not overwhelming. I personally don't like lavender at all but i think the scent of this product is acceptable. Triticum Vulgare Germ Oil, Corylus Avellana Nut Oil, Simmondsia Chinensis Seed Oil, Glycine Soja Oil, Oryza Sativa Bran Oil, Tocopheryl Acetate, Boswellia Carterii Oil, Pelargonium Graveolens Flower Oil, Lavandula Angustifolia Oil, Linalool, Citronellol, Limonene, Geraniol, Rosa Damascena Flower Oil, Vetiveria Zizanoides Oil, Anthemis Nobilis Oil, Daucus Carota Sativa Seed Oil, Chamomilla Recutita Extract, Citral. I have dry cheeks and this facial oil definitely helped with that. I definitely recommend this product to people with a dehydrated skin, dry skin or people who has dry spots like me. I love that it feels so moist on my face without feeling oily. My face feels very soft after applying the oil and also when it has absorbed. It gives me a very healthy glow, without looking greasy which I really LOVE. You can use it at night as well as in the morning as your make up base. It's a pity that it takes around 10-15 min until its fully absorbed which is pretty long. Besides, the price is pretty high and it didn't reduce any of my spots.